The Father Miguel O'Reilly House has been a part of the lives of the Sisters of St. Joseph since the first eight Sisters arrived from the Motherhouse in Le Puy, France, amid the late summer heat of September 1866. 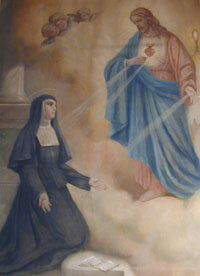 The Sisters had volunteered to come to St. Augustine in answer to the call of Augustin Verot, then Bishop of Savannah, who had traveled back to his hometown of Le Puy the previous year. Verot wanted the Sisters to come to Florida to teach the children of the recently freed African-American slaves. The O'Reilly House, which by the time of their arrival had been held in trust for 54 years, became their first convent and first school. Sixty-three years earlier, Father O'Reilly, then pastor of the St. Augustine parish, had the foresight to prepare a detailed will in which he left his residence, which had served as the parish rectory, for the benefit of an order of nuns "for education according to the plan of St. Francis de Sales." (The Congregation of the Sisters of St. Joseph, though primarily based on the constitutions of the Society of Jesus, were influenced by the works of St. Francis de Sales.) The banner artwork on the page, "About the House," is a detail of Father O'Reilly's will in Spanish. The description speaks of "two stone houses with their orange groves." Upon Father O'Reilly's death in 1812 the house was held in trust, first by his brother James, and then by the wardens of the parish. Ten years after the Sisters arrived in St. Augustine, Bishop Verot, who by this time had become the first bishop of St. Augustine in 1870, transferred the property cited in Father O'Reilly's will to the Sisters of St. Joseph. Today they still hold the title. 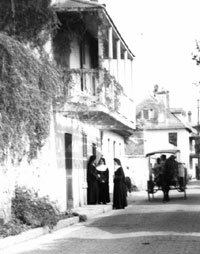 The Sisters of St. Joseph of St. Augustine, Florida trace their origins directly to the Motherhouse in Le Puy, France, where the Jesuit priest, Jean-Pierre Medaille, founded the order in 1650. The goal of the Congregation of the Sisters of St. Joseph, then as now, is "union with God, among themselves and with every kind of neighbor." There are a number of sources from which to learn more about the early history of the order, including its suppression during, and reformation immediately following, the French Revolution. One interesting perspective is provided in the 1910 edition of the Catholic Encyclopedia. Other sources include the Federation of the Sisters of Saint Joseph and the Sisters of St. Joseph of St. Augustine, Florida. Although engaged in all works of mercy, the Sisters' main work since arriving in the United States has been education. In that time, the Sisters of St. Joseph of St. Augustine have opened over 100 missions in the State of Florida, most of them parish schools. 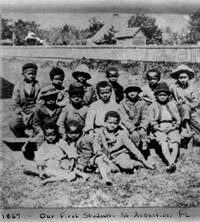 Beginning with the first class of African-American students in 1867, the Sisters shortly thereafter also started teaching white students, separately, in the segregated South. In 1874, the Sisters opened St. Joseph Academy, and in 1898, with funds provided by St. Katharine Drexel, the Sisters of St. Joseph began teaching African-American students at St. Benedict the Moor School in Lincolnville. In 1916, it became illegal for whites to teach blacks and vice versa. Three Sisters challenged this law and continued teaching at St. Benedict's. They were arrested, though the charges were later dropped. St. Benedict the Moor School remained open until 1968 when Florida schools became integrated. It was also in 1916 that the Sisters opened the Cathedral Parish School. Both the Cathedral Parish School and St. Joseph Academy continue to provide quality Catholic education to students of St. Johns County. The Sisters of St. Joseph of St. Augustine are also associated with a number of other schools throughout the state. In addition, the Sisters are involved in Health Care, Social Work, Parish Ministry, as well as Art & Spirituality. In 1867, within months of arriving in St. Augustine, Florida, from Le Puy, France, the Sisters of St. Joseph began teaching their first class of African-American students. During the latter 19th and early 20th centuries, one of the ways the Sisters of St. Joseph expressed their devotion and demonstrated their God-given talents, was by painting tapestries of religious scenes. By the time this photo was taken, shortly before the end of the Second Vatican Council, the Sisters of St. Joseph already had been teaching school in St. Augustine for almost 100 years.